There’s no better place to buy a Toyota than at Cambridge Toyota, your dealership at the heart of the town where best-selling Toyotas are made. 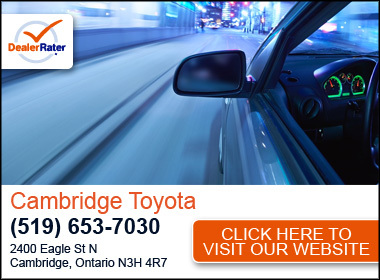 We’re close to all the action at the Cambridge Toyota plant, and we have some of the best services around. Is it any wonder we’re your regional Toyota dealer? My husband and I were so pleased with the amazing friendly service from Eva. She went above and beyond to make sure we got the car we wanted. I would highly recommend you ask for Eva if you are looking for a customer focussed sales associate! "Professional, knowledgable and respectful service"
I'm on my third Toyota from this dealer and with the same salesman, Craig Price. I have always found him to give me honest and knowledgeable information about the cars I'm interested in. There has never been any pressure (I would have left immediately if that were the case and never returned)... I always felt the decision was in my hands, not his. Buying a new car is stressful and in some ways the sales people need to recognize this and respect the nature of this huge purchase. They do at this dealership. The Service department is amazing and easy to access with reasonable wait times, lots of coffee and treats and friendly chatter. Yes, the labour cost is high compared to private mechanics but they know their cars inside out. I tried other mechanics when my cars got older but always returned to this dealership because I trust their work and let's face it,.. they train to work on the very cars they sell... they have a reputation to keep up... and believe me, they do great work hiring staff who are friendly, warm and accessible... I have seen this dealership evolve over the years and its impressive. I convinced my husband to buy a Toyota and trade in his Chev and when he meet my salesman and test drove my Corolla with me, he was convinced. We are now both proud owners of Toyota vehicles! 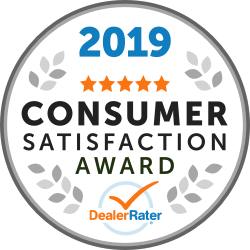 "Honest, friendly and great customer service"
Lots of dealerships try and sneak in extra prices for things that you never asked for or ever heard of. Craig from Cambridge Toyota didnt. He went over the agreement with me and helped me find the right toyota for me. They helped me with any issues i had and any concerns with buying my first NEW vechicle. It went smootly. I would defiantly recommend Craig at cambridge Toyota!